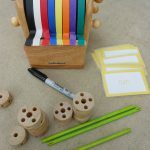 Fun spelling words games and easy sight word activities are in demand around here. We have two beginning readers. I know that a strong foundation in sight words and spelling words will give them an extra boost when they sit down to read a book on their own. 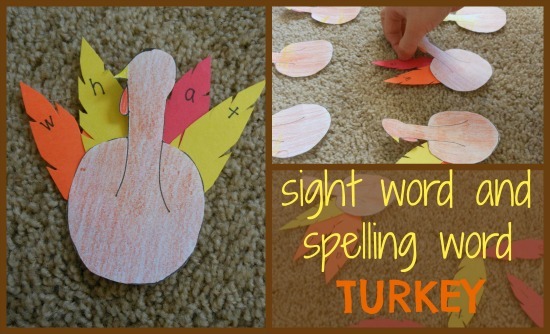 Adding a Thanksgiving twist with this turkey spelling activity for kids just seemed like the thing to do. 1. Print out the Turkey. Big M gets 8 spelling words a week so that is how many turkeys you will find on the printout. If you need more just print two pages. Color the turkeys or have your little one color them. 3. Since Big M hasn’t had much trouble with the spelling words he’s come across so far I spread the turkeys and the feathers out then I read each word aloud. He spelled out the words with the feathers. If these were words that he needed practice with I would have written the word on the turkey for him to see and match. Once your little one has mastered this set of spelling words ask them to see what other words those letters will make. 1. Print out the Turkeys. Color the turkeys or have your little one color them. Write one sight word on each turkey. 2. Print out the feathers. (You will probably need more than one copy.) Write each sight word on 4 or 5 feathers. Color them in. 3. Spread out the feathers and hand your kid a turkey. Ask them to find all the matching feathers. Use the word a lot so that they are seeing and hearing it at the same time. Once you little one has had some practice with these words have them read each turkey to you while you find the feathers. 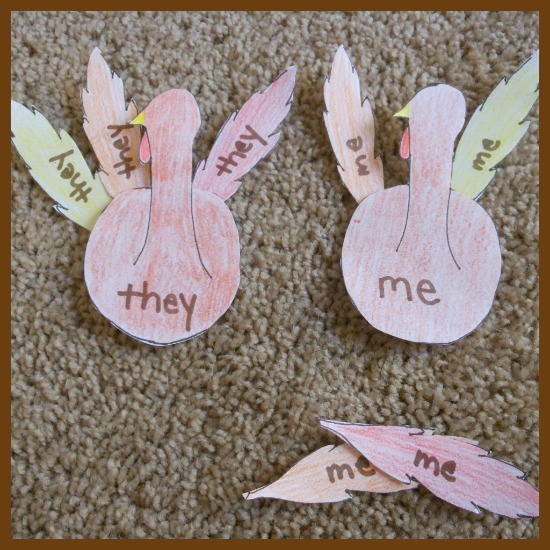 This turkey spelling activity for kids post is a part of the Thanksgiving lesson plan and originally appeared on November 8, 2012. Love, love, love this site word activity! Fabulous way to grasp my sons attention while learning and having fun. This looks real fun, I’m going to do it and teach my daughter. Thanks for sharing this. Love this! Featuring on my KBN roundup of Favorite Fall Activities and Crafts for kids at: http://www.happyandblessedhome.com/fall-activities-and-fall-crafts-for-kids/ Thanks for sharing! Pinned!